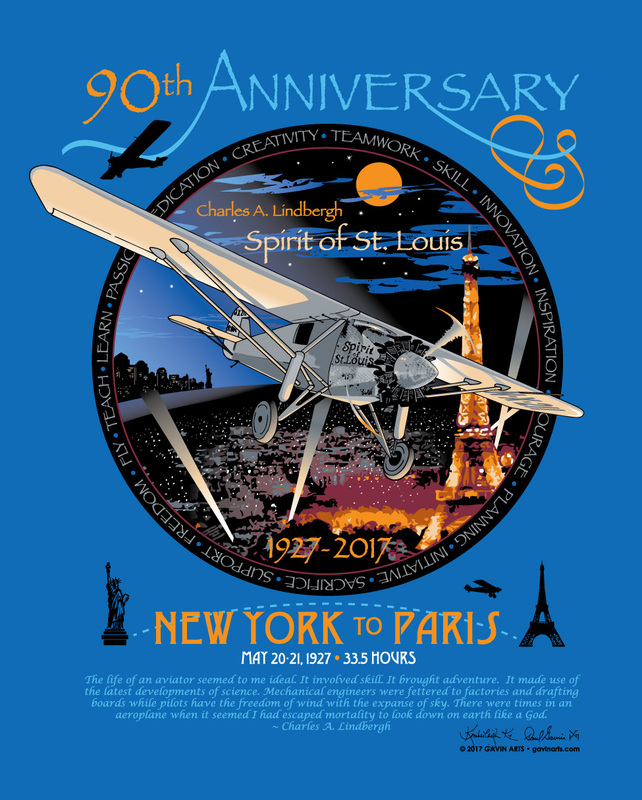 The 90th Anniversary of Charles Lindbergh's nonstop New York to Paris Flight is May 20 - 21, 2017. In 1927 Lindbergh and the Spirit of St. Louis, also known as NYP and N-X-211 launched from Roosevelt Field on Long Island, New York with four sandwiches, two canteens of water and 451 gallons of gas. They arrived over Paris at 10:00 at night and landed after 33 1/2 hours and 3600 miles. While an amazing feat for Charles Lindbergh as an individual it was a team effort with those that believed in and financed the project along with the entire crew that designed and built the Spirit of St. Louis in such a short time frame that made this single flight the huge world renowned event successful. Kimberleigh & Paul Gavin wanted to commemorate this 90th Anniversary of Charles Lindbergh’s flight, the Spirit of St. Louis and all those involved in a single image for a t-shirt and poster. But how? What would capture and express this flight and this team most succinctly? After some thought they knew. It would be the Spirit of St. Louis circling the Eiffel Tower in the night sky just before landing, illuminated from below by the lights of Paris with New York’s Statue of Liberty on the distant global horizon and around the whole design would be a circular border containing words describing the qualities of Lindbergh and the entire team. Also included is a fitting Lindbergh quote describing aviators and aviation. It’s a beautiful design and the underlit Spirit of St. Louis seems to fly off the page. The Gavins coordinated this piece with EAA and they will soon be available on the EAA website. Until then if you are interested or have any questions about this design please contact the Gavins at info@gavinarts.com. See more of Kimberleigh and Paul Gavin's designs and art work at thier Gavin Arts Site.